Overlooked: The Transfiguration experience of Moses and Elijah. 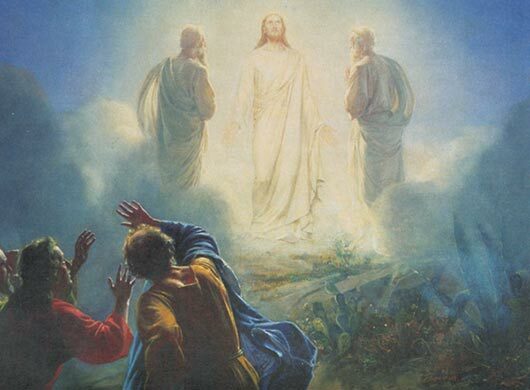 There are many remarkable aspects of the account of the Transfiguration of Jesus Christ (Luke 9:28-36) that will be explored in the next several posts. Now about eight days after these sayings he took with him Peter and John and James, and went up on the mountain to pray. And as he was praying, the appearance of his countenance was altered, and his raiment became dazzling white. And behold, two men talked with him, Moses and Eli’jah,  who appeared in glory and spoke of his departure, which he was to accomplish at Jerusalem. Now Peter and those who were with him were heavy with sleep, and when they wakened they saw his glory and the two men who stood with him. And as the men were parting from him, Peter said to Jesus, “Master, it is well that we are here; let us make three booths, one for you and one for Moses and one for Eli’jah” — not knowing what he said. As he said this, a cloud came and overshadowed them; and they were afraid as they entered the cloud. And a voice came out of the cloud, saying, “This is my Son, my Chosen; listen to him!”  And when the voice had spoken, Jesus was found alone. And they kept silence and told no one in those days anything of what they had seen. Peter, John and James, the three disciples who are part of Jesus “inner circle”, awaken to see Jesus conversing with Moses and Elijah. Moses and Elijah have been “dead” for quite a while: Moses (about 1200-1600 years), Elijah (800 years). How is it that they can appear? Where have they been? How do the disciples recognize that these are, indeed, Moses and Elijah? The Bible does not say. Their appearance is astounding testimony to the divinity of Jesus Christ: Moses represents “the Law” (Moses was the giver of the Law in the Old Testament) and Elijah represents the greatest of the great Prophets in the Old Testament. Both are summoned by Jesus; both show up. These two are the only Old Testament figures to hear God’s voice; Moses (Exod 24:18; 1 Kings 19:8-18). Now, they get to talk to Him face to face! Now, Moses and Elijah are given the beautiful gift of seeing God face to face and as they converse with Jesus. After a long wait, Moses and Elijah are able to witness the Divine Plan of Salvation History, in which they themselves have played key roles, is coming to fruition. Jesus Christ is the center and summit of Salvation History; God coming to earth. Sometimes, He brings people from dead with Him.